Life of Smiley: Oh, snap! And you thought Texas was eager to execute people. WASHINGTON, DC -- U.S. Military and U.S. Intelligence leaders have told NBC News former Iraqi dictator Saddam Hussein could be executed by Sunday. NBC News reports the U.S. Military has received a formal request to transfer Saddam to Iraqi authorities. It's one of the last steps required before Saddam's execution by hanging. U.S. Intelligence leaders tell NBC News the execution is expected to occur by Sunday, possibly as early as Friday. 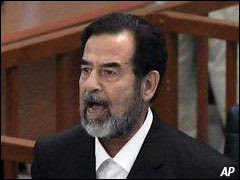 Saddam received the death sentence for the murders of 148 Shiites in the northern city of Dujail.